Turn-key means we handle your entire remodel project, from start to finish. You only have one person to deal with throughout the entire project. You make decisions, and we make things happen. At Kitchen Emporium, we take every precaution during the remodeling process to help it to be a pleasant experience. When we are removing any walls or soffits above the cabinets, we block off doorways to have a controlled work environment, with very little dust getting to the rest of your home. We also will put down tarps or blankets to protect your floors unless they are being replaced. Our trusted, qualified sub-contractors will work standard hours between 8AM and 6PM unless different arrangements have been agreed upon. 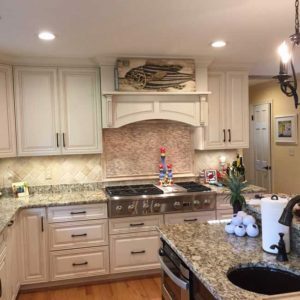 As a Class A Contractor, licensed in the Commonwealth of Virginia, Kitchen Emporium has a long relationship with most of our subcontractors. We have selected some of the best in the area, after all, the quality of their work reflects back on us. When an unforeseen problem occurs, our team works together to solve problems quickly and professionally. Select subcontractors. From electrical and plumbing to insulation and HVAC, everyone you need will be there. Acquire Permits. Most tradesmen will get the permit relating to their trade. Schedule All Work. Your contractor keeps up with when each trade needs to do their work before others can do theirs. Some trades may need multiple visits. Coordinate Information. Making sure each trade shares critical information is an important part of your contractor’s job. Install Appliances. Your contractor confirms all necessary connections are roughed in before installation.